Martha Washington geraniums (Pelargonium domesticum) produce large, showy blooms in shades of pink, white, purple, red and yellow early in spring. Of all types of geraniums, Martha Washington is the most difficult to grow, and often won't bloom after the first spectacular display, especially if summer nighttime temperatures exceed 60 degrees Fahrenheit. For this reason, they work best as an indoor plant. Native to South Africa, they are also known as "lady geranium" or "regal geranium." Place the Martha Washington geranium in moderate light. A spot a few feet away from a well-lit window, or near a window shaded with a sheer curtain, is best. Avoid hot, direct sunlight, which will fade the petals. If you're attempting to grow these outdoors, place the plant where it will be exposed to bright morning sun, but protected from hot afternoon sun. Keep the geraniums in moderate temperatures. Daytime temperatures should be between 65 and 70 degrees Fahrenheit. Nighttime temperatures shouldn't exceed 55 degrees Fahrenheit. Water Martha Washington geraniums whenever the top of the soil feels slightly dry to the touch. Don't overwater, as they are susceptible to root rot, especially if temperatures are too warm. Water at the base of the plant, and try not to splash water on the foliage. Feed every month during spring and summer, using a water-soluble houseplant fertilizer. 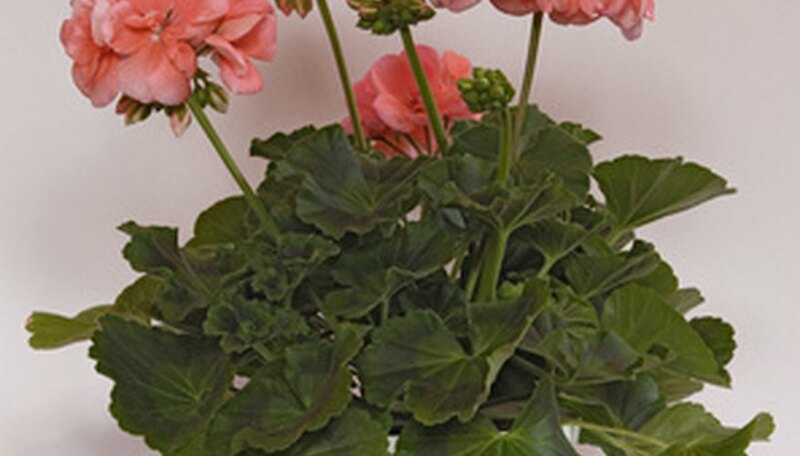 If your Martha Washington geraniums are grown outdoors, feed them a water-soluble fertilizer for blooming plants. Fertilize every other month during fall and winter. Cut back to 4 to 5 inches above the soil in late autumn. If the geranium is planted in ground, dig it up and put it in a container for winter. Store the plant in a bright, cold room where the temperature won't fall below freezing. Water occasionally to prevent the soil from becoming too dry. Resume normal treatment in February. Repot in early spring when the plant displays strong growth. Remove the plant from its container and trim the roots with kitchen shears, removing long roots or roots that are soft or brown. Transplant to a larger container filled with commercial potting soil. Be sure the container has a drainage hole. If grown outdoors, replant it in the flower bed when danger of frost has passed.